Circa 1:50pm, Tuesday, July 25. 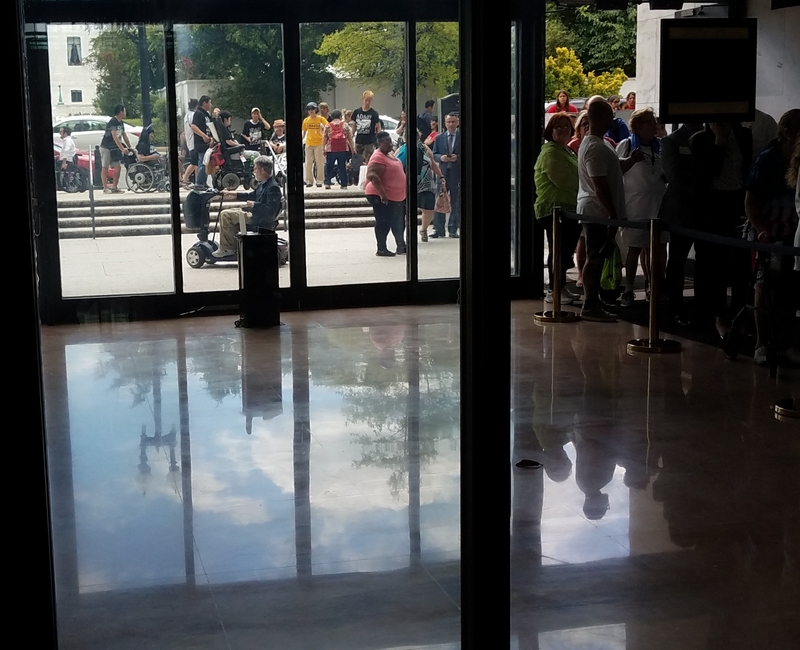 ADAPT activists queue up for admittance to the Hart Building at the Constitution Avenue entrance. 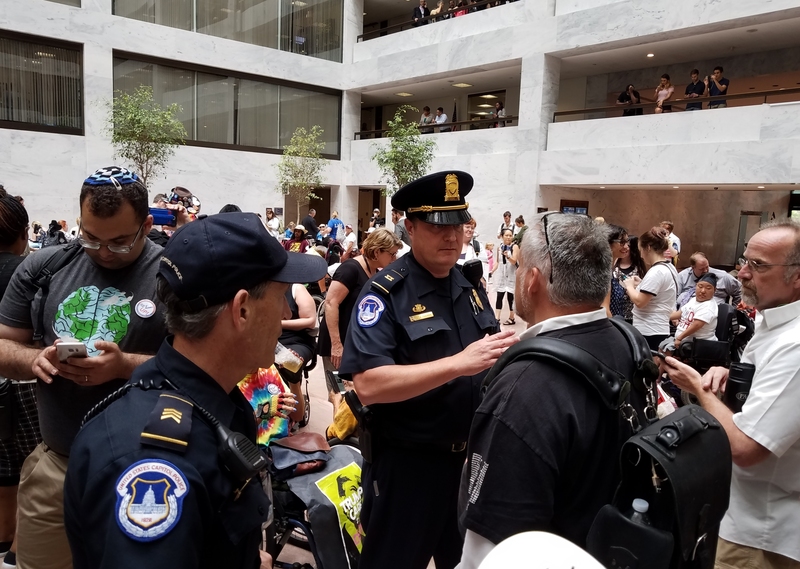 U.S. Capitol Police negotiate with organizers the processing and treatment of protesters who choose to be arrested. 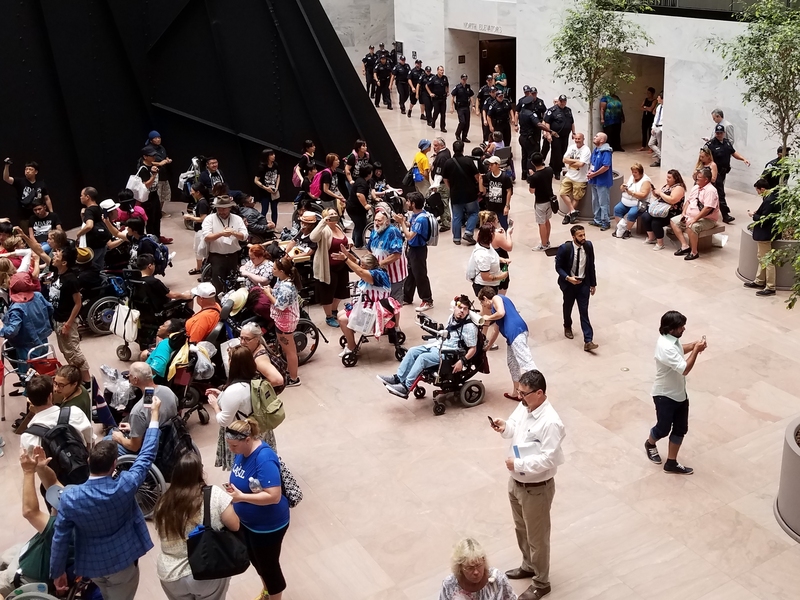 The loosely organized protest in support of preserving Medicaid and independent living comprised individuals representing the American Association of People with Disabilities and representatives from the National Conference on Independent Living. More than 200 people were involved. The protest took place in the Hart Senate Office Building atrium at the base of Alexander Calder’s iconic sculpture, Mountains and Clouds. Click to enlarge. 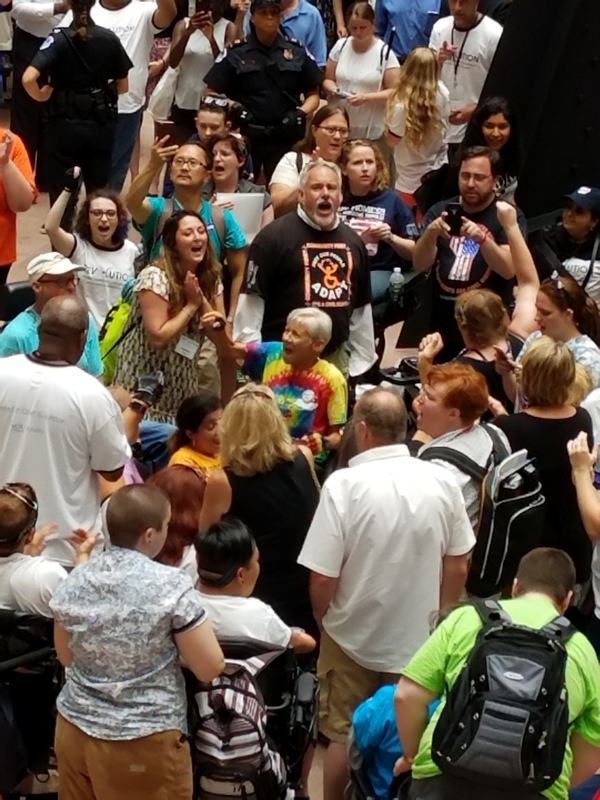 Once leaders announced that the vote on the motion to proceed to the GOP health care bill was underway, protesters started chanting – “Don’t Touch Medicaid.” At center is demonstration organizer Bruce Darling, President and CEO of the Center for Disability Rights Inc., to his left, Dr. Gregg Beratan, Policy Analyst for the CDR. 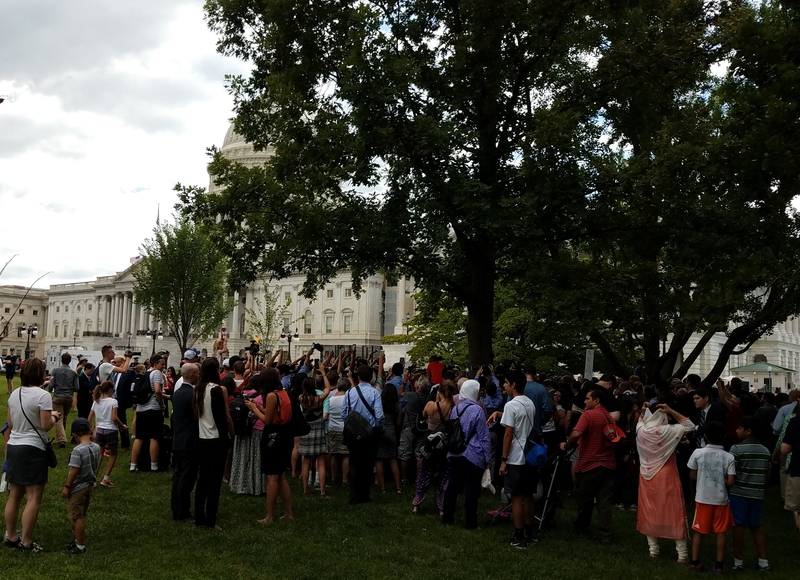 After the chants started the police warned that the demonstration was illegal and and protesters who remained were subject to arrest, the police moved in. Those who did not want to be arrested moved outside the police lines. 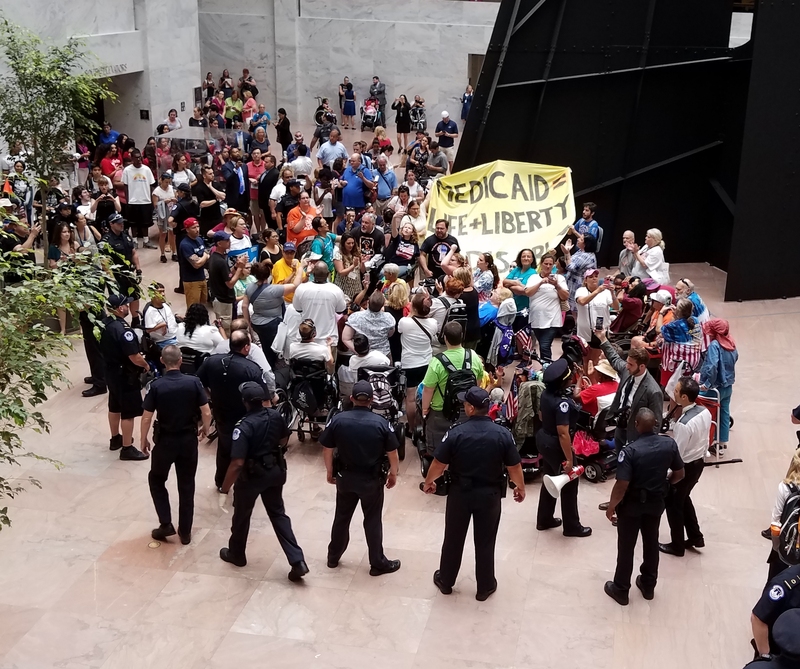 Dozens, chanting “I’d rather go to jail than die without Medicaid” were arrested. 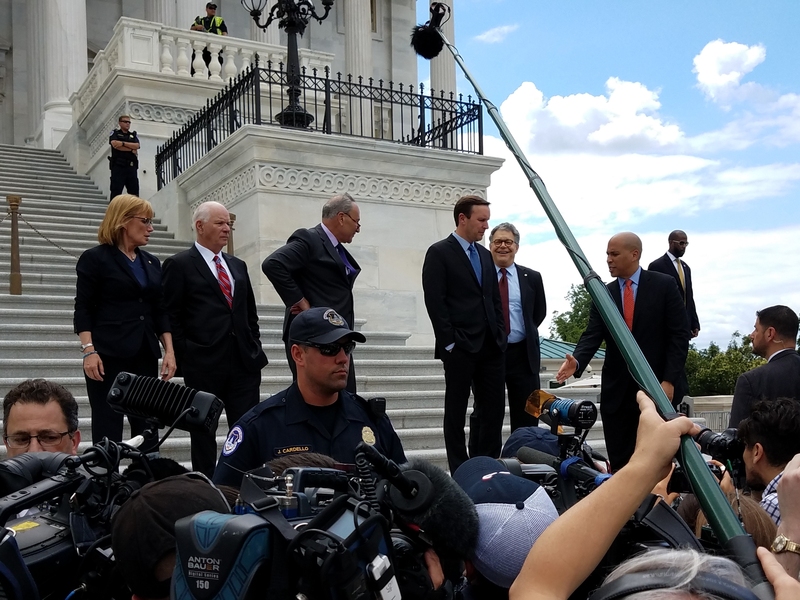 A closer view shows Sanders at left center of the photo, with Jeff Merkley of Oregon by his side. After the press conference, and circa 3:45pm just after the Vice President’s motorcade had departed the East Front, Senators moved the rally to the Senate steps. PSA 106 meets at 7:00pm at the Community Center at Capitol Quarter, 1000 5th Street, SE. ANC6B Hill East Task Force meets at 7:00pm at St. Coletta of Greater Washington, 19th and Independence, SE. MPD will brief the Task Force and Hill residents on automated traffic calming measures which can be applied in Hill East. Email Task Force Chair Dan Ridge at 6b09@anc.dc.gov with questions. In September of 2016, after DGS Director Chris Weaver refused, City Administrator Rasheed Young abruptly and in violation of protocol fired two employees of the agency’s contract and procurement division. The employees, Yinka Alao and Carlos Sandoval, alleged the firings occurred because they did not award a major Bowser contributor, Fort Myer Construction, contracts for work at the Buzzard Point Soccer Stadium and St. Elizabeth redevelopment sites. The inquiry did not reveal any direct evidence of political influence. The evidence disclosed that Fort Myer Construction does appear to be a favored District contractor. Senior Executive Officials took action in relation to the two contracts intending to benefit Fort Myer Construction. The Officials’ actions seem to contradict the assertion that preventing delay was their sole purpose in intending to benefit Fort Myer Construction. The firing of the two employees was not illegal, but seemed an unnecessarily harsh penalty based on offered explanations, and were procedurally irregular. Seeking support to issue the report from her fellow committee members, Cheh found it only from Councilmember Charles Allen. Three committee members – Evans, McDuffie, and Todd – indicated they would not vote to endorse the report. Cheh then decided to issue the report over her own signature. As the Washington Post reported on June 15, http://wapo.st/2u8CXYF the Mayor called the information about the alleged leak a “wild accusation” and that she would not pursue an investigation. This smacks of a cover up. If it were just a matter of one more shady deal, it would be one thing. But the callousness and indifference in disrupting three lives and the apparent breaching of ethics with impunity reveals a sense of entitlement and contempt for justice that lies at the heart of corrupt government. The Washington Post reported on December 8, 2016 http://wapo.st/2uROJtp that Alao had filed a $10 million suit against the DC government. Sandoval has filed for redress with the DC Office of Employee Appeals. These proceedings tend to be expensive, take forever, and the odds of success are stacked against the complainant. Whistleblower protections are that in name only, and there are numerous examples of lives and careers ruined by conscientious employees who believed that the law would protect them. According to the June 15 Washington Post piece, “Deputy Inspector General for Business Management Jaime Yarussi said the office was reviewing Cheh’s report.” That’s not enough. Earlier this month, CM Allen, Chair of the Judiciary and Public Safety Committee held hearings on campaign finance reform. 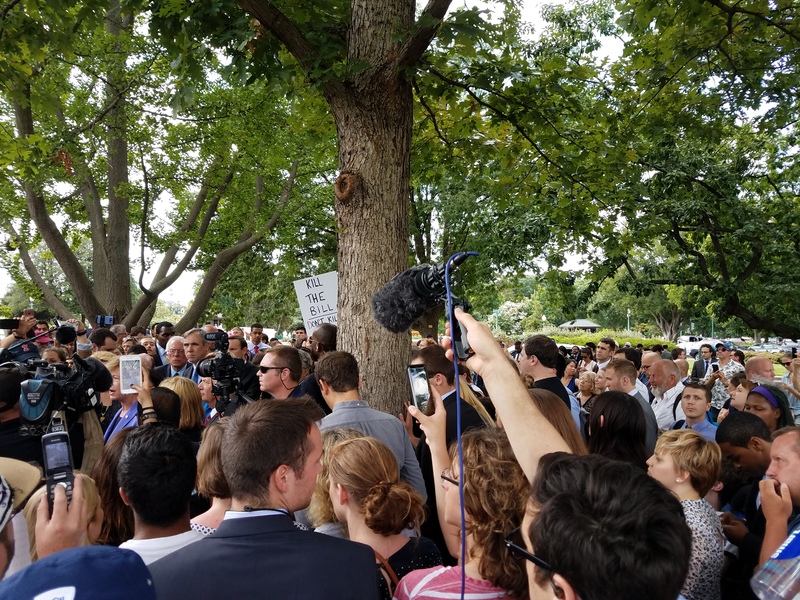 DC business organizations turned out in force to assure the Committee that the legislation wasn’t necessary. DCRA Officials Address ANC6B Resident Concerns on Construction/Home Business Violations, Etc. Top brass: DCRA Director Melinda Bolling, second from left; DCRA Zoning Administrator Matt Le Grant, second from right; Timothy Handy, DCRA Event Houses Regulatory Section, far right; Jason Washington, Assistant to the Director, far left. Capitol Hill residents with HPRB concerns. Tuesday, night, ANC6B’s Constituent Services Task Force, co-chaired by Commissioners Jennifer Samolyk and Diane Hoskins, sponsored a community meeting to hear the top brass from the city’s Department of Consumer Affairs (DCRA) address resident concerns on a number of issues under their jurisdiction. DCRA issues building permits, certificates of occupancy and home occupation, basic business licenses, and inspects for illegal construction. The meeting had been scheduled before CM Charles Allen’s pointed comments on the need for improvement in the agency last week (see below). Included in the issues raised by residents were difficulty reporting construction work before or after permissible hours (7:00am – 7:00pm, Monday through Saturday) because the violation has stopped by the time an inspector can be summoned; DCRA inspectors not responding to complaints; and work being done beyond what the permit allows. The DCRA officials did not offer a remedy to address concerns regarding before and after hours construction work other than to say there is supposed to be follow-up from inspectors when no one is in the office since inspectors are “pinged” (not clear what that means) when a call comes in. Director Melinda Bolling said she should be notified personally if inspectors do not show up in response to a complaint. With respect to work being done outside the permit, Bolling said that as of six weeks ago, additional details on the scope of the permit have been provided – that prior to that time, a portion of what the permit covers was regarded as sufficient information for posting. Another issue common to several residents was the failure of the city to notify residents of construction in our neighborhoods. 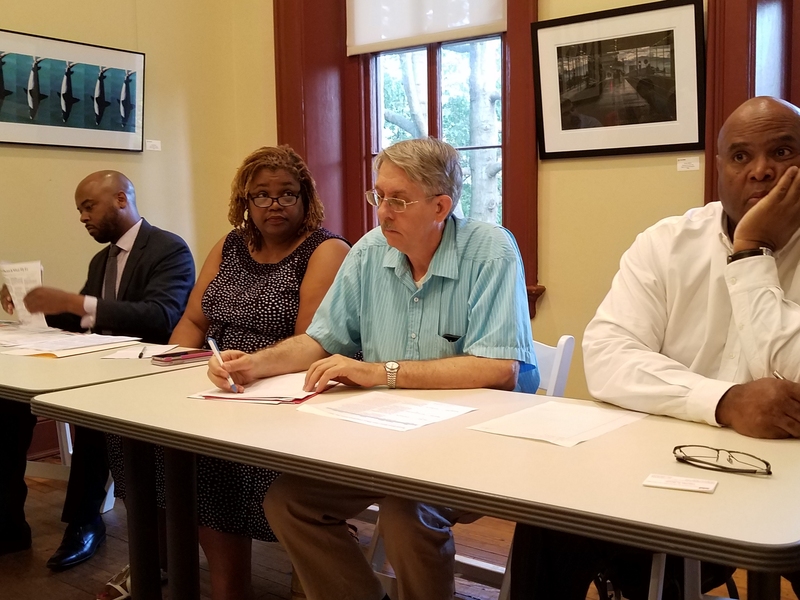 Matt Le Grange, DCRA Zoning Administrator, said that most of the 4,000 building permit applications DCRA receives annually are for work being done as a matter of right and there is no requirement for notification. The Construction Code provides residents must be notified if construction affects their property’s underpinning or party wall but if there is none, the law does not require notification. In the Historic District, until recently (see below) the Historic Preservation Review Board is not required to notify neighbors, but that responsibility still falls mainly to the individual resident who must follow the HPRB agenda or the ANC Planning and Zoning Committee agenda as posted organization websites. According to ANC6B Planning and Zoning Committee chair Nick Burger who was present, the advance notification by Bureau of Zoning Administration of neighbors within 200 feet of an application for a zoning change works well, and that as of this month, the HPRB notifies adjacent neighbors of Historic Preservation Applications. On another matter, one resident explained at length a hazardous post-raze issue on a property adjacent to his home and presented a strong case for the need for a post-raze inspection by DCRA. Bolling said she would take the recommendation to the Construction Code Coordination Board. Several residents of New Jersey Avenue, SE, raised the issue of businesses operating illegally out of residences. Le Grant said that residents are allowed to use a portion of their home for businesses purposes after obtaining a Home Occupation Permit (HOP) and a business license. He said the HOP application is very detailed and if an individual resident meets the standards, they are allowed to operate a business out of their residence. 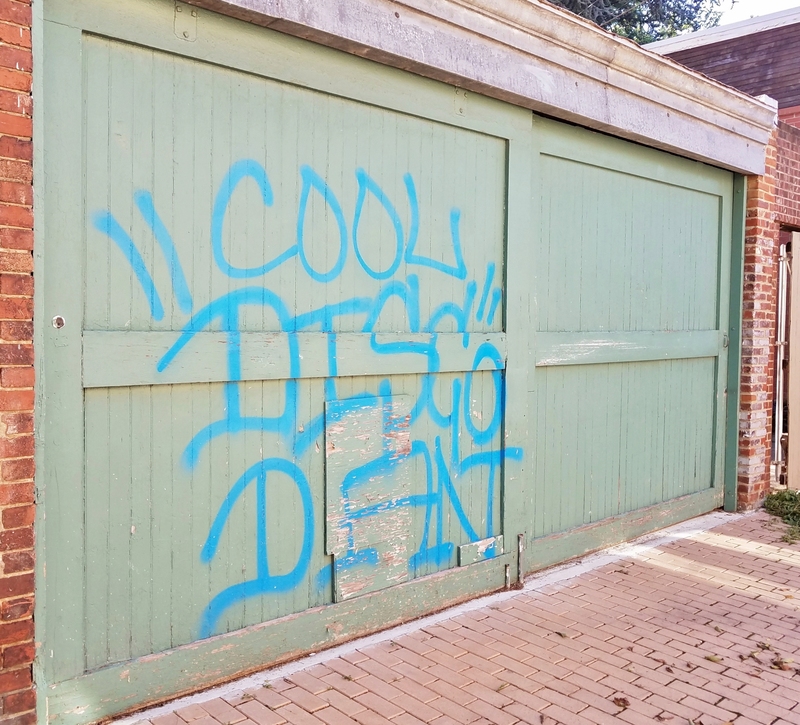 (Residents say that there are cases where DCRA inspectors give a building owner the benefit of the doubt over the evidence to the contrary offered by neighbors that a townhome is being used as a residence). Regarding instances where lobbyists and nonprofit organizations are using residences as office space, a complaint will result in an investigation to determine that the owner has a HOP and is in compliance. Timothy Handy of DCRA’s Event Houses Regulatory Section says that DCRA can revoke a HPO. Once a complaint is filed the investigation could take 60 to 90 days but many factors could extend that. Regarding concerns about Air B&B operations, Bolling said that the current “non-policy policy while we’re working on a policy” means that residents can “get away with” using a part of their homes for a short term rental as long as the tenants don’t cause problems – in the latter case, DCRA treats it as an impermissible rental. A prohibition on short term rentals for apartment buildings is easier to enforce. 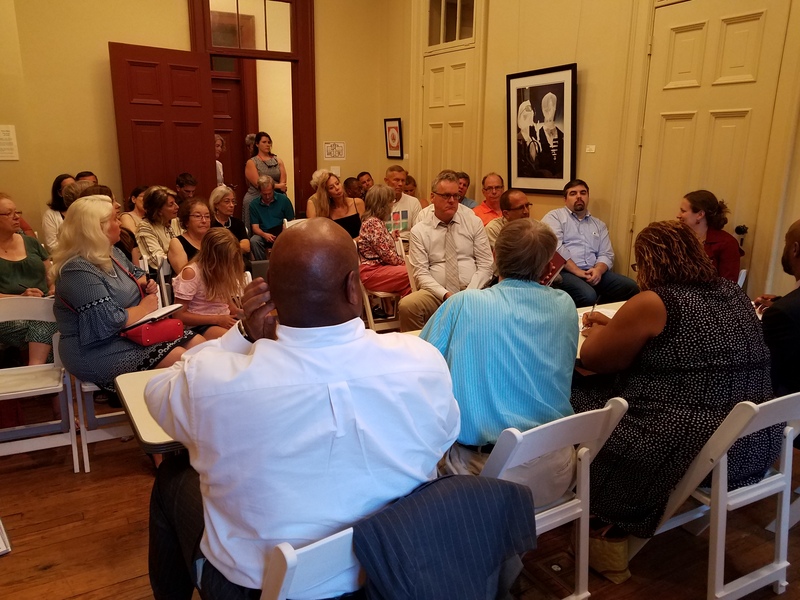 The willingness of the agency’s top brass to turn out to listen to residents’ reflects an apparent concern which is somewhat at odds with actual DCRA operations which resident’s deal with on a day to day basis. The latter point was driven home by Councilmember Charles Allen, who told a Capitol Hill community meeting last week that DCRA is the “one agency which has caused us the biggest problems and has the most improvements to make” and “that the agency needs a top to bottom shakeup.” Allen said that too often DCRA thinks that their customer is the permit applicant, and he has to remind them that it’s the Department of Consumer Affairs. Comments Off on DCRA Officials Address ANC6B Resident Concerns on Construction/Home Business Violations, Etc. 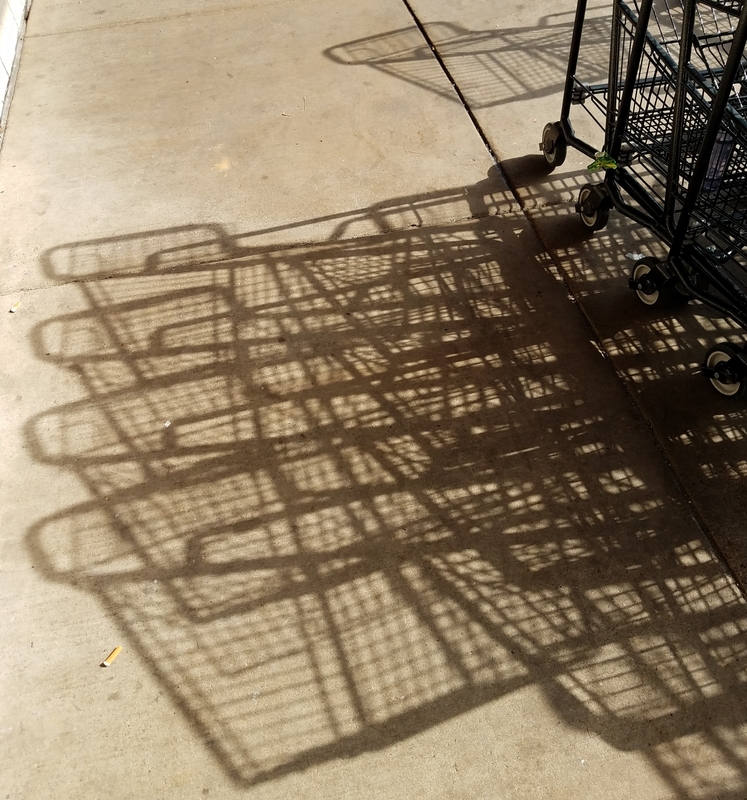 Southeast Safeway, Tuesday, July 11, 2017, circa 9:00am. Presentation by DDOT officials of 30% plans for Florida Avenue NE redesign project. ANC6B Outreach & Constituent Services Task Force meets at 7:00pm in Hill Center, 921 Pennsylvania Avenue, SE. ANC6A Alcohol Beverage Licensing Committee meeting, scheduled for 7:00pm at Sherwood Recreation Center, 10th and G Streets, NE, has been CANCELLED. The next scheduled ABL meeting will take place on Tuesday, August 15, 2017 at 7:00 pm at the Sherwood Recreation Center, Corner of 10th and G Sts. NE. ANC6A Economic Development & Zoning Committee meets at 7:00pm, at Sherwood Recreation Center, 10th and G Streets, NE. 1362 East Capitol Street, NE, zoning adjustment – special exception from the rear yard requirements of to construct a two-story rear addition to an existing one-family dwelling in the RF-1 Zone. 1203 D Street, NE, zoning adjustment – special exception from the lot occupancy requirements of to construct a two-story rear addition to an existing one-family dwelling in the RF-1 Zone. 237 Warren Street, NE, zoning adjustment – special exception from the rear yard requirements of and from the upper floor addition requirements to construct a rear and third-story addition to an existing two-story one-family dwelling in the RF-1 Zone. 225 Tennessee Avenue, NE, zoning adjustment from the rear yard requirements to construct a three-story rear addition to an existing one-family dwelling in the RF-1 Zone. 226 12th Place, NE, – applicant seeks support for HPO approval of plan to convert an existing two-story, two-unit row house to a single-family residence and do a 10-foot extension at the rear of the house. Ward 6 Democrats will hold their Biennial Membership Meeting to elect officers and conduct other business on Saturday, July 22, from 10am to 2pm at the NE Library, 330 7th Street, NE. Nominations for officers will be accepted up to the election time. Contact Chuck Burger @ chuckburgr3@msn.com or (202) 258-5316. Councilmember Allen briefed Capitol Hill residents on plans for Eastern Market Plaza and Southeast Library. At right is Jerry Sroufe, who along with Marci Hilt and Carl Reeverts, are co-chair the meeting’s sponsor, Eastern Market Metro Community Association. Some of the residents and stakeholders who turned out for last night’s meeting in Southeast Library. 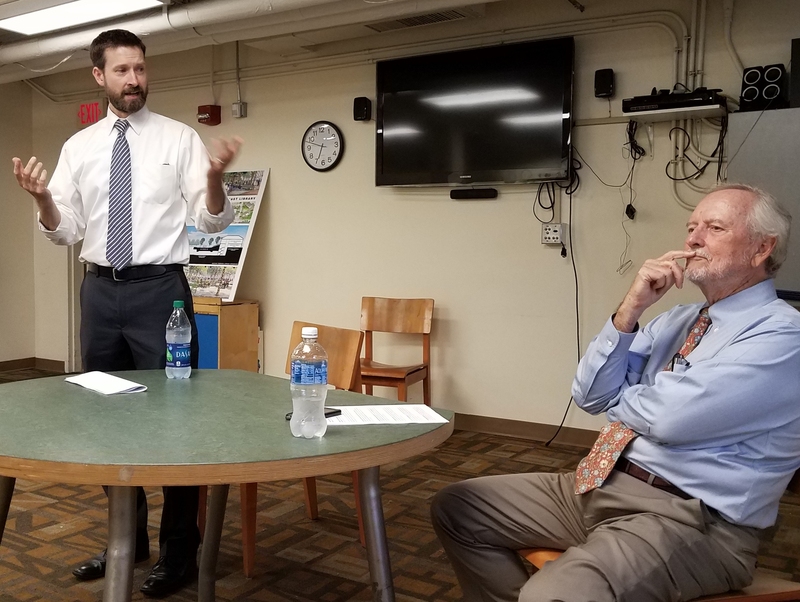 Charles Allen met with Capitol Hill residents last night to brief them on the status of the redesign of Eastern Market Metro Plaza and the related renovation/expansion of Southeast Library. The meeting in Southeast Library was sponsored by Eastern Market Metro Community Association. Allen said that the future FY funding will take the rest of the redesign concept to the planning level, likely following the guidelines of a plan formulated by architect Amy Weinstein, though realizing that plan will require additional money. 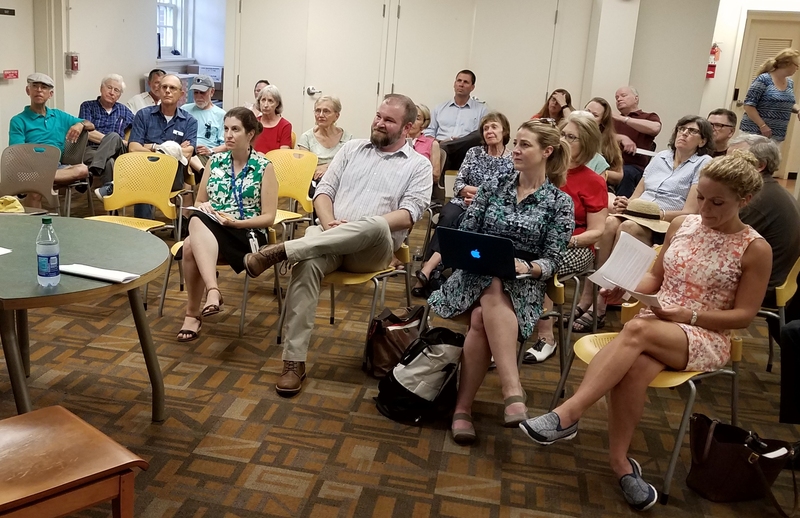 The 2014 Weinstein plan, which was funded by a Congressional earmark to Barracks Row Mainstreet, placed a price tag on the overall project of $45,213,645 million – $13,517,595 for the parks and plaza, $22,765,637 for the library, $8,930,413 for DC Agency management fees plus reorganization of traffic, and a $1.54 million maintenance endowment to provide the estimated $75,000 annual maintenance costs. See here CHC report: http://bit.ly/2mOFrHG. The Weinstein plan includes a redesign of the Southeast Library with a major expansion under 7th Street and a new entrance on the Plaza, but Allen cautioned that there is no current plan for redesign of the Library, and noted that DC Library officials believe that the Weinstein plan will cost more than the $22.7 million price tag she placed on the project. The officials also raised concerns regarding multiple entries to the library which will require twice the current staff. Renovation and expansion of Southeast Library – one of the city’s smallest and busiest – has been budgeted to the tune of $10.9 million in FY 19, and $12.5 million in FY 20. None of those funds can be used for the Plaza, but timing is such that they will be available for use at the same time the Plaza plans will unfold. Allen said that he views the Plaza as an extension of the library, and the challenge will be how to incorporate use in the Library renovation. 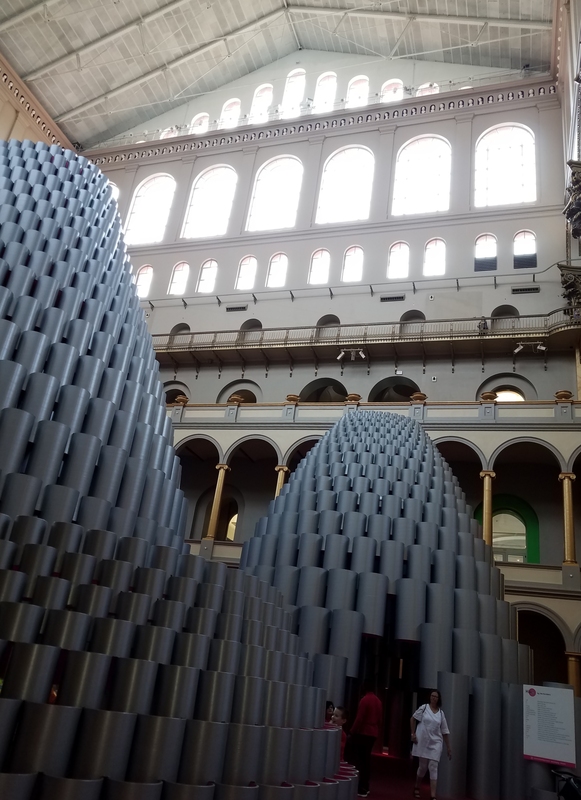 DC Library is anticipating a “soup to nuts” modernization, gutting the current historic structure, and rebuilding it in a way more in accordance with the way libraries currently function. Allen said that a year from now, he expects the community engagement to begin, in advance of the first round of funding becoming available in October of 2018. Here’s the original concept design that MGM brought before ANC6C last month. And here’s what ANC6B voted to support Wednesday night. 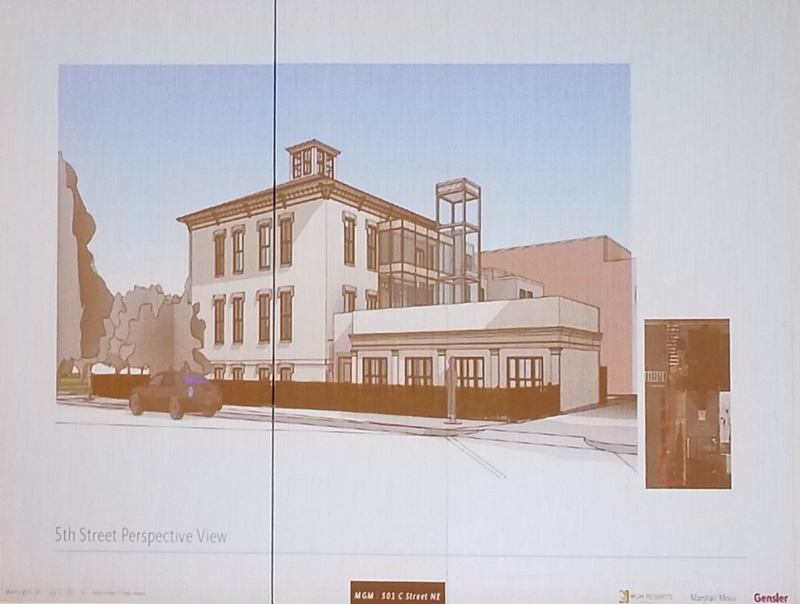 Wednesday night, ANC6C – which had twice forced MGM back to the drawing board on its historic preservation design plan for its Stanton Park lobby shop – finally voted to support a last minute plan meant to address concerns of both the ANC and nearby neighbors. There were two major concerns. The 1600 square foot party deck and the exterior elevator tower and accompanying bridge which MGM had initially proposed for the south side of the building. MGM had previously eliminated the party deck. Late yesterday, they floated a proposal to address the objectionable external elevator. The problem, according to MGM architects, is that DC regulations require two separate exits for the building. Currently those requirements are satisfied by two separate interior staircases, separated by an appropriate distance. MGM had proposed to meet ADA and company requirements with an exterior elevator. ANC6C’s vehement opposition brought forth the new proposal. In order to move the elevator inside the building, MGM said they had to put it in the place of an existing staircase. 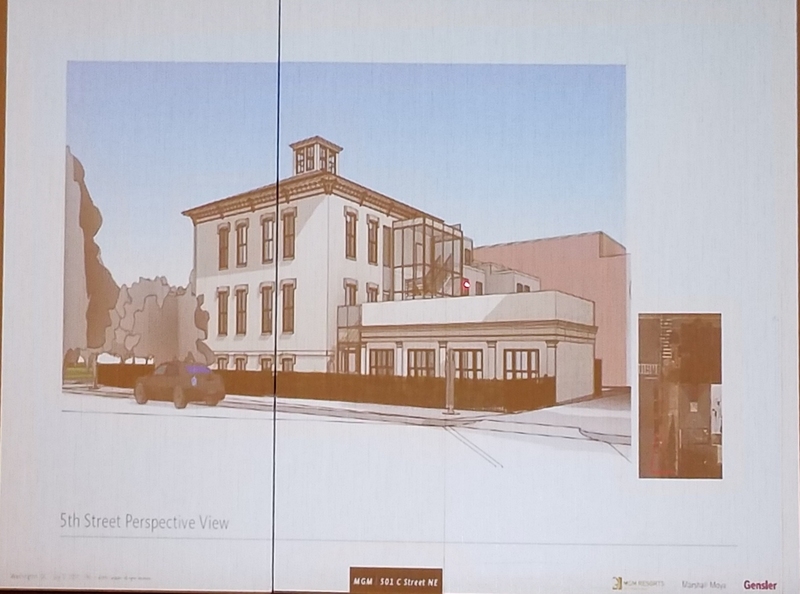 The requirement for an additional exit, they say, requires a 9 X 19 foot (glass-enclosed) exterior staircase, which they propose adding to the rear of the building. Putting the additional staircase inside, they said, would eliminate three offices on the first to third floors. There was grumbling among the ANc commissioners. Planning and Zoning Committee Chair Mark Eckenwiler noted that some of his Planning and Zoning Committee members were opposed to the new design. But, he said, the new concept was an improvement and he was willing to support it after MGM agreed to eliminate some incongruous windows aligned with the exterior staircase. Commissioner Scott Price, in whose single member district the project lies, said that the current design was far more tasteful than the original proposal. 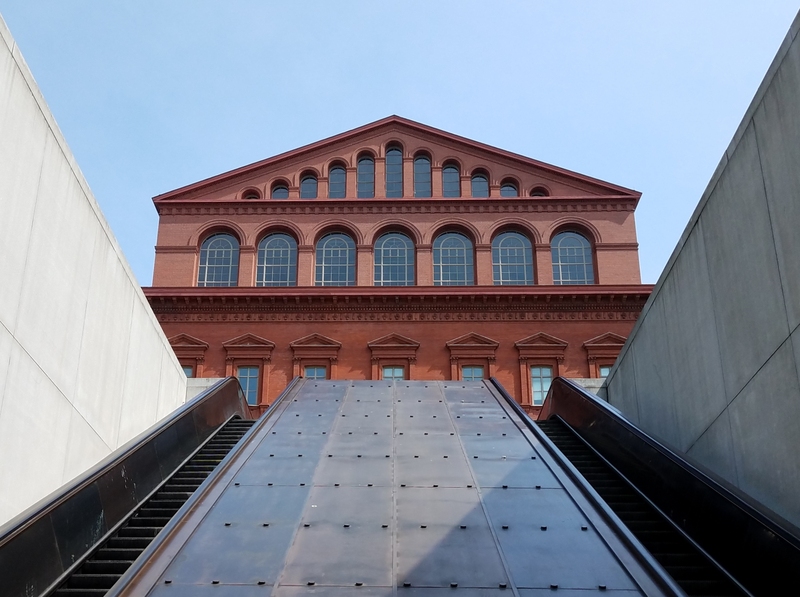 He said that getting rid of the party deck and parking issue had been “great” changes, and though he didn’t like the exterior staircase, the DC government had done the same thing on the Northeast Library. Despite the uneasy era of good will, it seemed to some ears that a stake has not been driven through the heart of the party deck issue. 818 Potomac Avenue, designed by PGN Architects. The main entrance will face Southeast. The building to the left is 816 Potomac Avenue, which will provide an additional 30 residential units. The schematic shows the project’s relationship to the Virginai Avenue Community Gardens and the proposed Virginia Avenue Park which will be restored after completion of the CSX Tunnel Project. The arrow points to the 818 Potomac Avenue site south of the freeway, a short walk to Barracks Row. 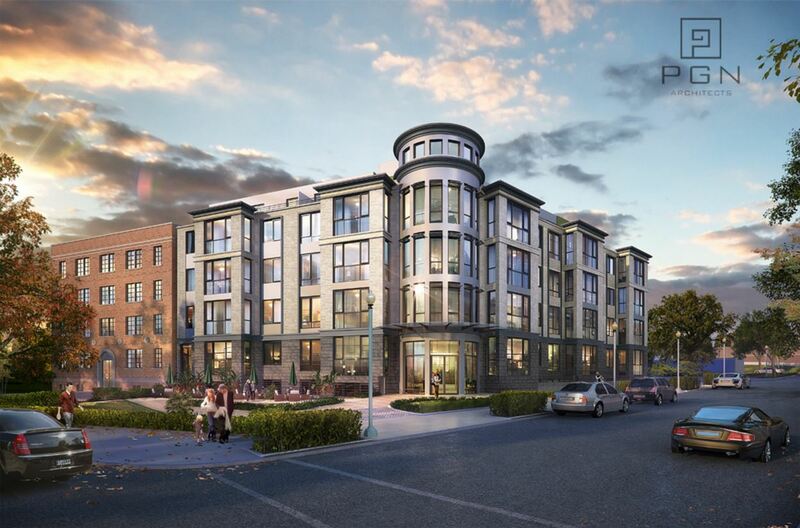 Wednesday night, ANC6B’s Planning and Zoning Committee unanimously endorsed Murillo/Malnati Development Group’s Historic Preservation Application for a proposed four story 45 unit apartment building at 818 Potomac Avenue, Southeast. 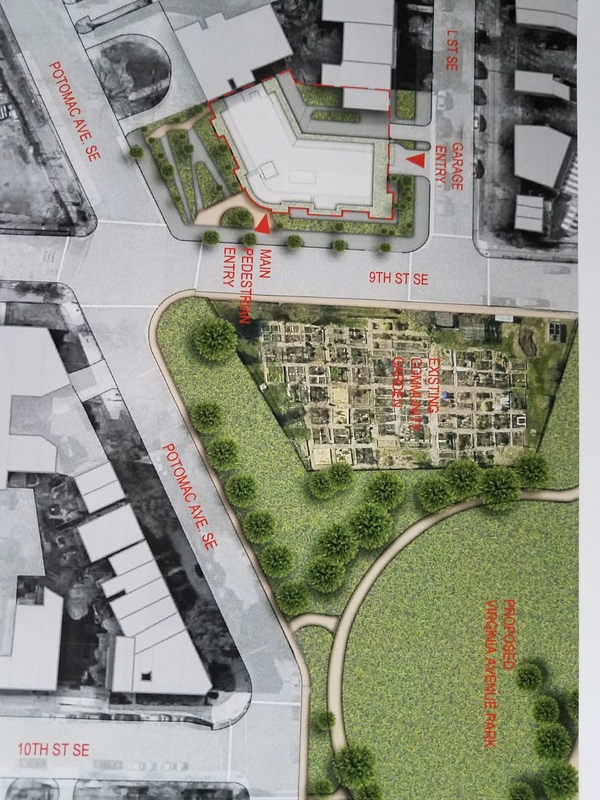 The project, designed by Capitol Hill based PGN Architects, will overlook the Virginia Avenue Community Garden across the street to the east. The project anticipates some 25 two bedroom units. 30 to 40% of the balance will be made up of one bedroom units and the rest studio apartments. The project follows the recent trend away from condos and toward rental units. 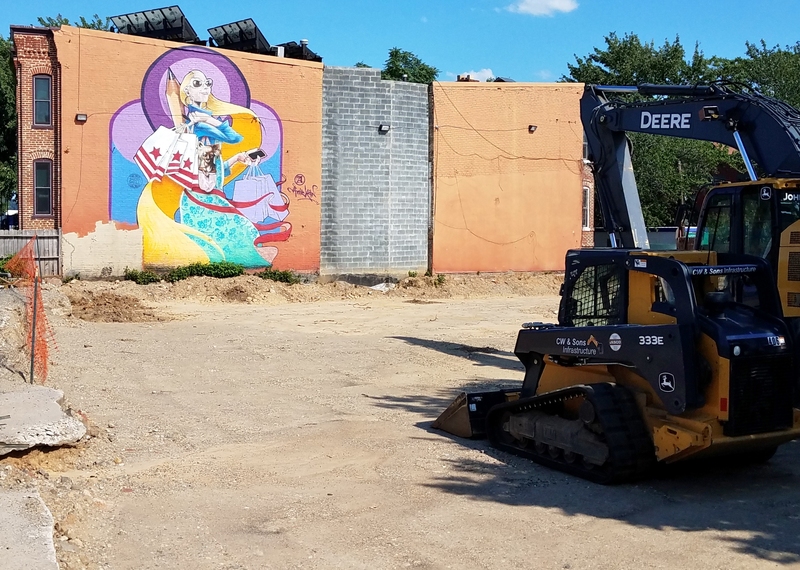 The project will utilize a mechanical lift to provide 49 parking spaces – against the trend of providing fewer rather than more parking spaces in a project this size. 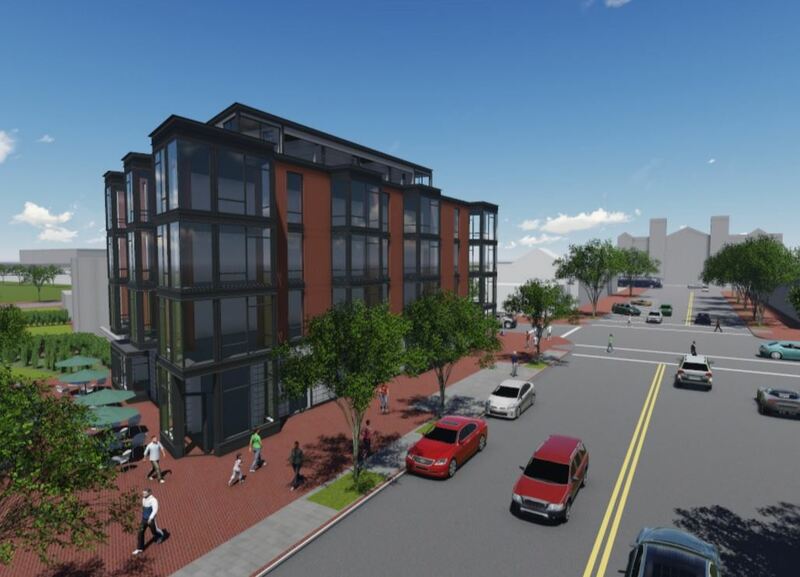 The project will deliver an additional 30 or so units when the renovation of an adjoining building at 816 Potomac Avenue, SE, is complete. 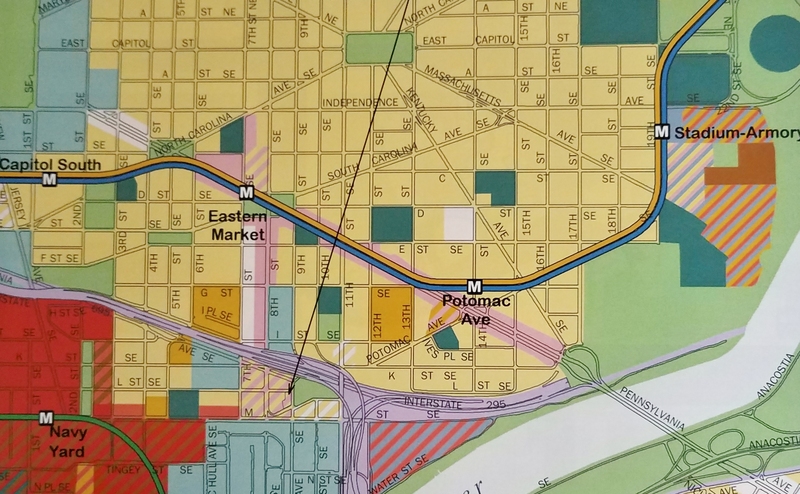 The Application will come before the full ANC6B at its meeting next Tuesday, where it is expected to receive the Commission’s enthusiastic endorsement. The developer will be back before the ANC later this year seeking relief from zoning regulations since the project otherwise would come under the Eighth Street Economic Overlay which requires 50% of the ground floor to be retail.